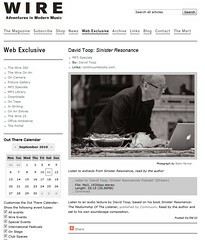 A photo of David Toop I took this summer has been used to illustrate an article in the online version of The Wire: Adventures In Modern Music. I am sure you will recognise David Toop as one of the foremost authors on contemporary music, not to mention his own significant achievements as a performer and composer. He often writes for this magazine himself. The photo illustrates an excerpt of Toop reading from his new book, Sinister Resonance: The Mediumship Of The Listener, published by Continuum. Go to The Wire page to hear this for yourself. Toop has also been using my photos for his Facebook presence. You might wish to visit my Flickr set of other shots from the same event, Sonic Vigil in Cork. And for those keeping track, this is my second shot to make The Wire, the first also being taken in Cork of a sound art performance by The Quiet Club.